An extra inning interference call against Arizona's AJ Pollock didn't hurt the Diamondbacks, who defeated Colorado three innings later, but drew the ire of D-Backs fans and broadcasters at the time. Executive Summary: Due to the runner's actions in failing to avoid the protected fielder in pursuit of a batted ball, this is interference pursuant to Official Baseball Rule 6.01(a)(10). Umpires meet to discuss the collision near 2B. The Play: With one out and one on (R1), Diamondbacks batter David Peralta hit a ground ball softly to second baseman DJ LeMahieu, who ran into D-Backs baserunner R1 AJ Pollock on his way to second base. Initially ruled "no interference" by 2B Umpire Toby Basner, the call was reversed to that of interference on Pollock upon consultation amongst Jerry Layne's crew. Relevant Rules: Official Baseball Rule 6.01(a)(10) is clear on the right-of-way rules when it comes to a fielder attempting to play a batted ball: "It is interference by a batter or a runner when—He fails to avoid a fielder who is attempting to field a batted ball...The umpire shall call the runner out in accordance with Rule 5.09(b)(3) (former Rule 7.08(b))." Rule 5.09(b)(3), for those wondering, states that a runner is out when he "hinders a fielder attempting to make a play on a batted ball." Diagram of the interference play in ARI. Make no mistake, however, that "Of course such 'right of way' is not a license to, for example, intentionally trip a runner even though fielding the ball" (Rule 6.01(a)(10) Comment). This same tenet applies to a fielder deliberately creating contact—or the appearance of hindrance—in order to draw an interference call. Analysis: Pollock only has one obligation as a runner during a batted ball: "avoid a fielder attempting to field a batted ball" (or "avoid interference with a fielder fielding a batted ball"), which is a phrase that appears three times in the Official Baseball Rules: once in 6.01(a)(10), once in Rule 5.09(a)(11) in regards to a batter-runner's legal exit from the three-foot-wide runner's lane, and once in Rule 5.09(b)(1) in regards to a runner's legal deviation from his established base path. The reason that three rules make reference to the runner's obligation to avoid a fielder attempting to field a batted ball—including two rules that go so far as to exempt the runner (or batter-runner) from compliance with runner's lane and base path restrictions—is that there is no function for the runner more important on a batted ball than avoiding contact with a fielder attempting to field said ball. Side angle of the runner-fielder interaction. With Pollock clearly failing to fulfill this #1 obligation (to avoid fielder LeMahieu), the only question is whether LeMahieu satisfied the portion of Rule 6.01(a)(10) regarding "a fielder who is attempting to field a batted ball." If the answer is "YES," this is interference and Pollock is out with Peralta awarded first base. If the answer is "NO," this is either nothing or potentially obstruction and the most likely outcome would be Pollock at second base and Peralta at first. Ready for the hockey analogy? Think of a fielder attempting to make a play on a batted ball like a goalie: run into him and it's likely an interference penalty. Why? Because, like a goalie with a puck, the fielder's first and only obligation on a batted ball hit toward him (and only him) is attempting to field it. 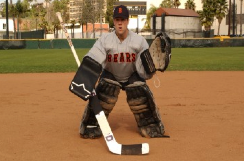 Like a skater, a runner is allowed to screen the goalie/fielder (albeit, unlike a skater, the runner can't park in front of the fielder), as long as he avoids the defensive player. And, like a goalie who goes after an opposing player instead of fulfilling his obligation to the puck, a fielder who fails to attempt to field a batted ball and instead targets a baserunner may be called for a penalty of his own, in the fielder's case, obstruction. (Things get complicated with two or more goalies...take a look at two fielders interacting with a runner—or with a batter-runner). 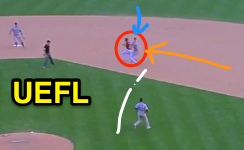 Back to the play at hand, with runner Pollock having failed to avoid fielder LeMahieu, the benefit of the doubt is conferred upon the fielder, who, by rule, also possesses the right-of-way for this play. LeMahieu's route takes him to the left-field side of the batted ball, but Rule 6.01(a)(10) makes absolutely no consideration for the fielder's efficiency or route selection. It is immaterial; the only question is whether LeMahieu attempted to field the ball, regardless of his strategy in doing so. 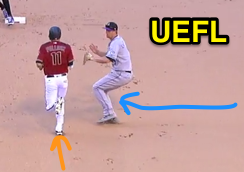 LeMahieu does appear to run in the general direction of the batted ball, and there is insufficient evidence to suggest he failed to attempt to field the baseball (Why? Because LeMahieu's contact with Pollock prevented us from seeing how the play would have transpired absent such an interaction). Thus, Pollock failed to avoid a fielder attempting to field a batted ball and was properly ruled out for this interference. Sidebar: Batter-runner Peralta was not credited with a single on this play (the "batter gets a single on interference" idea is a myth); it was a fielder's choice. Rule 9.05(b)(5) states, "The official scorer shall not credit a base hit when a—runner is called out for interference with a fielder attempting to field a batted ball, unless in the scorer’s judgment the batter-runner would have been safe had the interference not occurred." 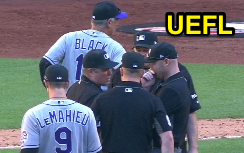 Thus, the official scorer ruled that, absent interference, LeMahieu's attempt to field the batted ball would have actually retired Peralta at first base had he been able to complete his intended play. Rationale: No rules support the assertion that on a batted ball, the runner is entitled to the baseline.